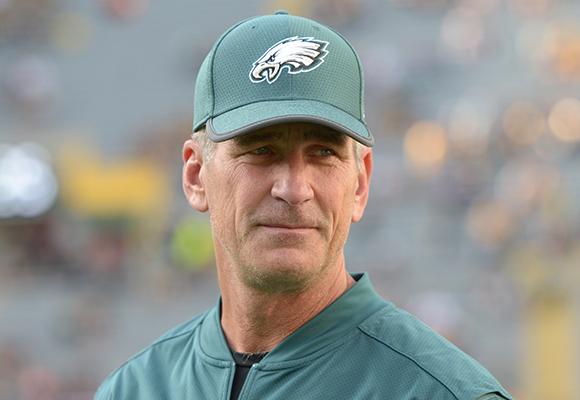 Eagles offensive coordinator Frank Reich is a candidate for the newly-open Tennessee Titans head coaching job according to Terry McCormick of Titan Insider. A longtime NFL backup quarterback, Reich’s coaching specialty has been wideouts and signal callers. He earned a promotion to offensive coordinator for the Chargers in 2014-2015, and then served as the Eagles’ offensive coordinator the past two years under Doug Pederson. Reich deserves part of the credit for the rapid development of QB Carson Wentz and the Eagles’ imaginative game plans but it should be noted that Pederson calls the plays in Philly. The Titans also plan to interview Texans defensive coordinator Mike Vrabel and Carolina Panthers DC Steve Wilks for the opening in the coming days.